A mosaic tile shower is the desire of many homeowners undertaking a bathroom remodeling project. Mosaic tile possesses a classic, traditional look that lends grace to your bathroom. And for good reason: mosaic has been used for thousands of years for both practical and aesthetic purposes. 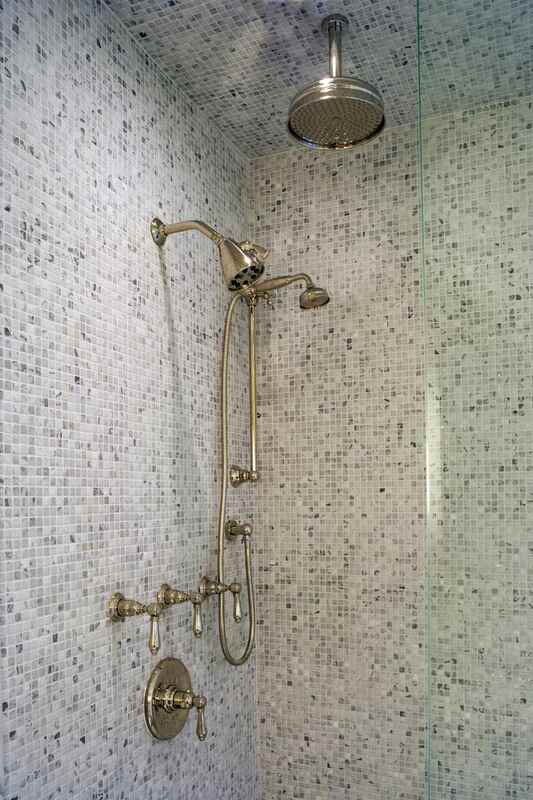 Spend a little time with our renovation pictures and descriptions of mosaic tile showers. Maybe you will find just the right look for your house. Your mosaic tile shower doesn't need to be all mosaic. Here, glass mosaic makes up the upper border and the shower seat. One benefit of using mosaic for the shower seat is added grip. Your mosaic tile shower can employ mosaic for special touches, especially if this is a specialty tile or decorative tile. The true benefits of a mosaic tile shower are obvious when we're looking at special touches such as this inset soap shelf. Due to their small size (about 1 inch square average), mosaic tiles make cleaner edges for these unusual areas because fewer cuts are required. Notice the easy-to-do yet effective touch in this example from Hakatai of using a different type of mosaic tile for the back of the inset? This mosaic tile shower employs large expanses of a sophisticated charcoal from Hakatai. To break up the monotony, an inset above the controls allows for placement of candles, soaps, shampoos, or whatever simple bathroom decor your heart desires. For this mosaic tile shower and bathtub combination, a refreshing icy blue-green to waken up an otherwise dark corridor bathroom. This mosaic tile shower—due to the large glass door and transom window—gets plenty of light. This porcelain blend further enhances the bright look of this high-end shower. This mosaic tile shower is shimmering in blue glass. Note how the Ashland tile at the bottom graduates upward to the iridescent tile—a unique touch. A custom blend from Hakatai for this high-end mosaic tile shower. A deep, refreshing ocean-blue mosaic tile shower. A great general-use mosaic tile that works in many different applications. One of my favorites from Hakatai, Classic Ivy Blend turns this green mosaic tile design into a pleasant morning wake-up call. An interesting feature of this mosaic tile shower is the band cutting horizontally through the shower tile, and continuing around the rest of the bathroom. This mosaic tile shower continues the tile all the way around to the adjoining bathtub. This inset, made of slate blue mosaic tile, provides the perfect spot for shampoo and other essentials. Capitalizing on the ample light streaming from the window, this mosaic tile shower provides a cool, green environment for making bath time relaxing.